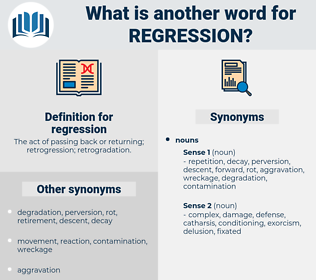 What is another word for regression? The act of passing back or returning; retrogression; retrogradation. decline, recession, deterioration, reunification, reduction, kickback, rollback, degradation, backtracking, retraction, handover, impoverishment, backspace, reverse, shrinkage, depletion. 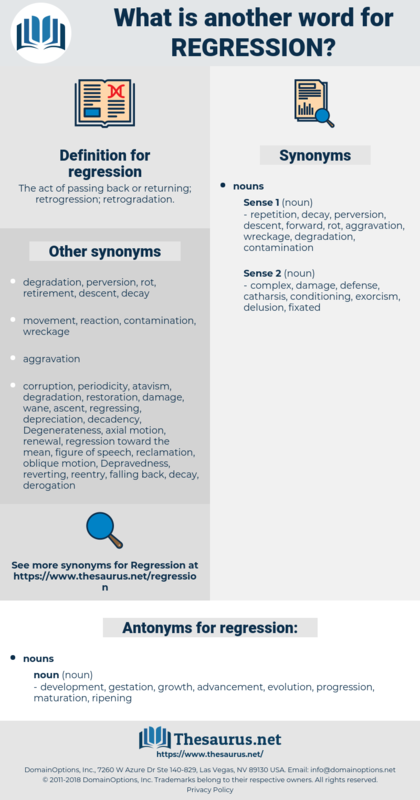 reversion, backsliding, setback, retreat, downturn, reversal, relapse, slippage, decrease, climb-down, slowdown. development, gestation, growth, advancement, evolution, progression, maturation, ripening. Defence Mechanism, defense, defense reaction, defense mechanism, Defence Reaction, defence.